NEW AT FLEET FEET SPORTS! Sweat X Sport is a specially formulated high performance sports laundry detergent that is designed to remove even the toughest sports stains and odors from technical fabrics such as Nike®DryFit®, and UnderArmour®. 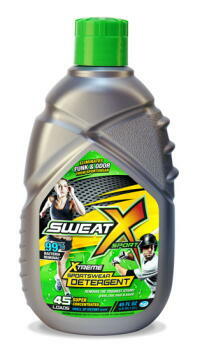 With its Nano Technology, Sweat X has an ultra thin formula that consists of tiny strands of bursting nano bubbles which penetrate and lift stains like grass, clay, sweat, mud, and blood. During independent testing, Sweat X Sport removed and eliminated greater than 98.5% of all bacteria that causes MRSA, STAPH, and acne in standard washes, which result was substantially better than that achieved by Tide Sport. The scientific reason behind this is that Sweat X’s nano based, proprietary cleaning molecule works to completely exfoliate the active wear garments and extract harmful bacteria from them.